Are younger adults in Menston less community minded? The promised News flash. this site is looking for two young aspiring journalists to keep it up to date for young people in menston. If you’re interested click here for further details! Just two weeks since this site was launched and it’s already had over 250 different visitors and almost 2,000 visits, and it’s yet to be indexed by Google. Surprisingly though, some visitors have not just been local or even just from the UK but include some from Belgium, Bermuda, Italy, Romania, Spain and the United States. Followers have been building more slowly, probably as there seem to be few WordPress bloggers (or bloggers at all) in Menston so they need to subscribe to ‘follow’ by email. But it’s the only way to keep up with the news, by getting a notification each time there is a new posting. The same seems to apply to comments: quite a few via email to menston.village.wharfedale@gmail.com – all positive so far – but few using the ‘comment’ box at the bottom of each post and page. As there will be a new post not more than twice a week your email box will not be bunged up by us. Why are younger adults less community minded – or so it seems? In the ‘About’ page for this site there is a comment about the many greetings you will get on a walk down Main Street. However, there is a distinct split in the reactions according to age, more so with males. I wonder why this is. A Menston resident contributor has also commented that he would like to see more ‘younger’ people getting involved in village activities, commenting “Just a bit conscious that there are a lot of elderly groups in the village but less for ‘younger’ people, especially those which encourage activity & social interaction”. I know of social activities proposed where the positive response has been far greater from people over about 30 than from those less than this. It’s not a matter of them having children as children have been welcome and events have been timed to suit them. Returning to the ‘greetings’, in my experience most people over about 30 who are met on Main Street will exchange a greeting, and many women who are younger. But when it comes to younger men, it is noticeable that many will positively avoid eye contact, even when greeted. Why is this? If you like a traditional Sunday lunch, and I do: roast – beef, lamb or pork – Yorkshire pud, roast spuds and a few veg. 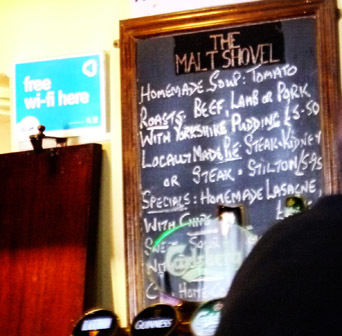 But if you don’t want to cook, a visit to the Malt Shovel in the village centre is recommended, especially as it won’t hurt your pocket very much. £5.50 for two courses – main and either soup or sweet of the day. None of the other village pubs can match that, in fact few anywhere. You can of course add a sweet if you opt for the soup including, eg, that favourite hot chocolate fudge cake and cream/ice-cream. And there are alternatives to the roast, including pies and lasagne. Last orders for lunch are at 1.45pm. It’s good old-fashioned Yorkshire cooking like my grandmother used to do, except that the veg are not cooked to death as hers always were. In fact you can eat lunch at the Malt Shovel any day of the week and the menu extends to more than a ‘roast dinner’. This entry was posted in Dining, General information, grumpytyke, Uncategorized, website news and tagged blogging, community, Menston, Menston website, pub lunch, Sunday lunch, Wharfedale, Wordpress, Yorkshire. Bookmark the permalink.